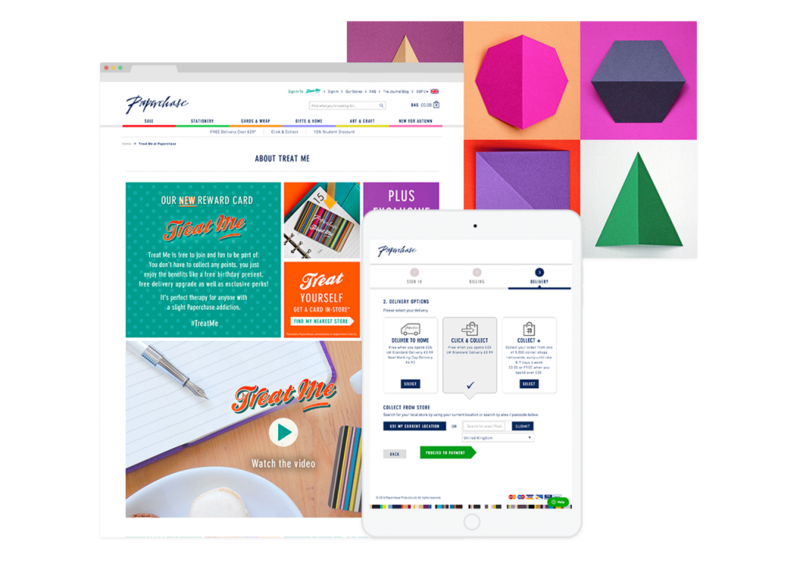 Paperchase, a British high street retailer specialised in innovative design-led stationary, approached us to aid their global online expansion. They wanted to move their online business to a platform which allowed for growth and scalability while offering a contemporary and responsive design to drive a growing, mobile driven audience. Improving the user journey and experience was also of importance to the brand, who wanted to appeal to a modern demographic while also developing a way of creating loyalty and gathering customer information. We created award-winning, comprehensive ecommerce solutions, including an innovative new ‘Treat Me’ loyalty scheme. 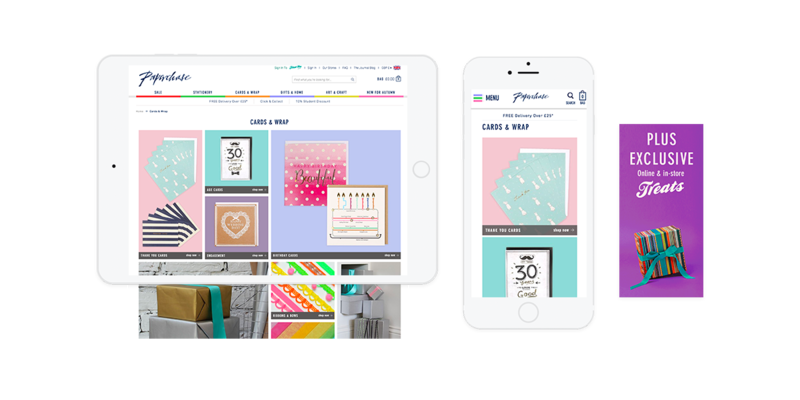 Since our relationship with Paperchase began, we Migrated their ecommerce platform to Magento Enterprise. 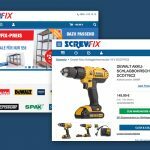 This enabled us to develop an omnichannel, fully integrated and scalable ecommerce strategy, delivered across a brand new, aesthetically alluring website. We rolled out new services including personalised greetings cards, nationwide ‘Click & Collect’ services and a new, unrivalled loyalty scheme. All built into a single channel optimised for mobile, desktop and tablet and expanded it to international markets. We introduced a nationwide ‘Click & Collect’ delivery service to heighten Paperchase’s existing premier customer service, giving access to wider range of products online without the inconvenience of postal timings. ‘Click & Collect’ services were self-contained within the Magento platform and linked directly with the distribution network and shop floors. As soon as the customer ordered a product, it would be tagged, shipped directly to the desired store and scanned on arrival. Scanning of the product automatically triggered an email to be sent to the customer, notifying them that their purchase was available to collect as soon as they wished. Growth in high street stores has occurred as a direct result of ‘Click & Collect’, which has driven people back into stores, capitalising on impulse purchases and up-selling opportunities. ‘Click and Collect’ is now 10% of our business, so that's a growing and important channel for us. And we know that 40% of those customers buy in store when they go pick up their orders. Another of our innovations was a take on the loyalty card model. 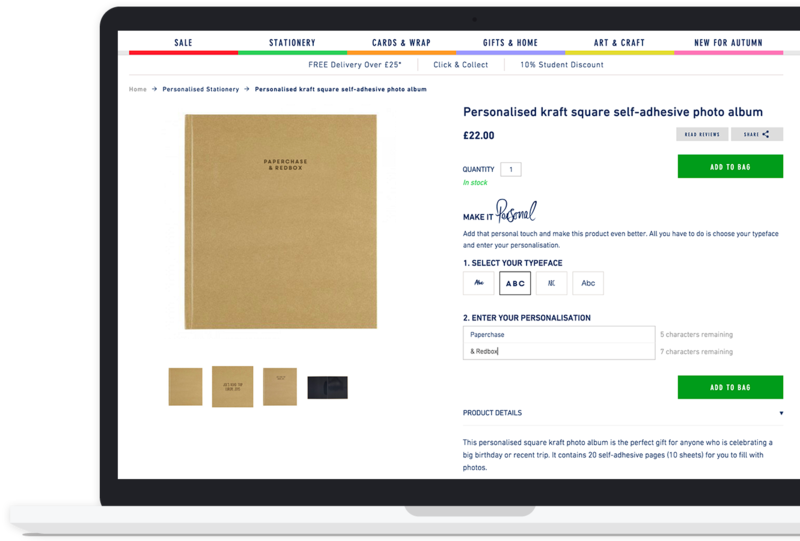 The aim was to collect valuable data and to build a community for Paperchase customers, by creating an omnichannel loyalty experience. 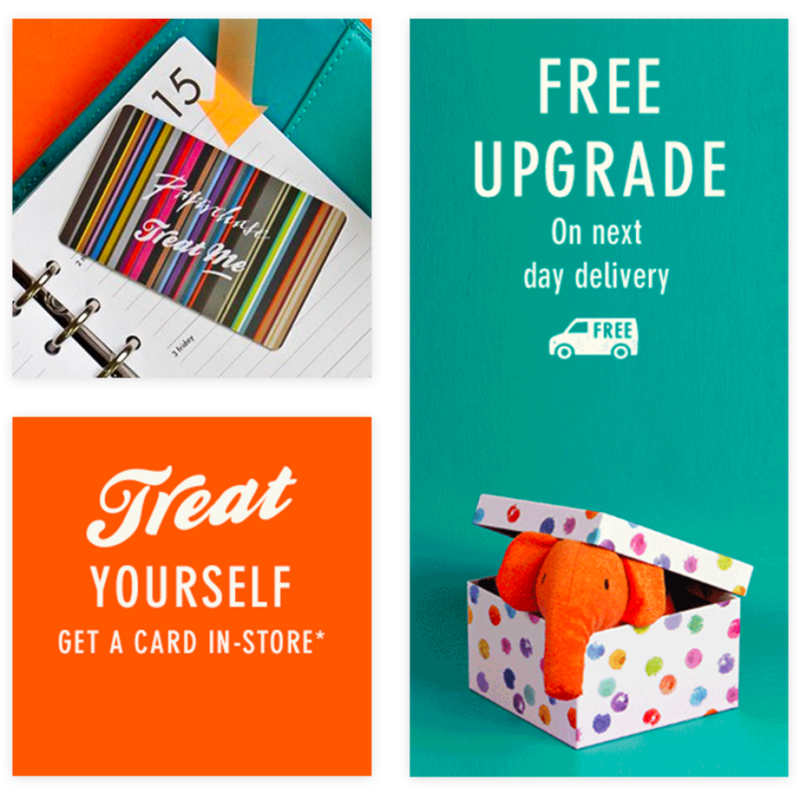 Unlike the traditional model of point-based loyalty programs, Paperchase’s ‘Treat me’ card gave frequent customers special ‘treats’; including discounts, free ‘Click & Collect’ or home delivery services, £10 birthday treats and even free coffee. Whenever the card is swiped in store or used online more benefits are accumulated, whilst simultaneously gathering transactional data for individual consumers and therefore empowering greater CRM. Since it left the trial stage in June 2015, over 125 000 customers have enrolled in the ‘Treat Me’ program, demonstrating how easily Redbox solutions can be scaled. The success of the UK Paperchase platform warranted the creation of dedicated sites in key US and EU markets. 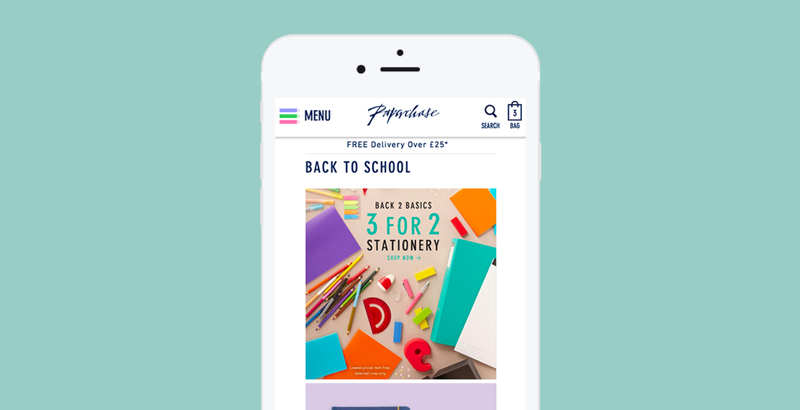 In May 2015, Paperchase France was launched featuring all of the systems of the highly successful UK and US sites. On-going online expansion has formed a trajectory with in-store success, as the more customers begin to utilise ‘Click & Collect’ and online loyalty services, the more reason they have to go back to the store. As part of the omnichannel experience implemented by Redbox, personalisation was another service added to the online experience. The service offers a variety of fonts and live visualisations of the finished product. As a result of our work with Paperchase, we were twice awarded ‘Partner of Excellence’ in 2014/15 and additionally received the gold award for ‘Site of the Year 2014’ from Magento. The ‘Treat Me’ loyalty scheme was nominated for ‘Loyalty Initiative of the Year 2015’ in the Retail Week Customer Experience Awards. Key trading periods for the business have had sales results and conversion rates exceeding 100% year-by-year. Growth in high street stores has occurred thanks to online services like ‘Click & Collect’ driving customers back in store. Founded in 2004, Redbox Digital is an internationally trusted ecommerce agency with a reputation for providing end-to-end digital and omnichannel commerce solutions for major brands across the globe, in both the B2C and B2B sectors. With offices in Auckland, Dubai, Mauritius, Sydney and London, we provide global capacity with local thinking. We’re also the leading Magento Enterprise Partner in the Middle East, supporting businesses in Dubai, Abu Dhabi, Saudi Arabia, Kuwait and Qatar.